Professional demonstration chess board made in Ukraine. Produced and used in Ukraine's largest chess club «Gambit». The unique technology is superior to their foreign counterparts. Lightweight and durable. Surface quality laminated, figures do not scratch the surface. Reusable packaging of this product allows to transport without damage demonstration board. Ideal for chess clubs in schools and kindergartens. 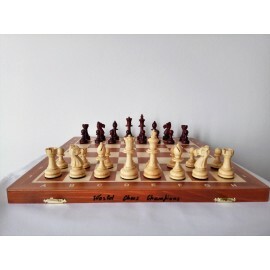 Note: Demonstration in chess are not supplied and must be ordered separately on our website! Professional chess, made in Poland. The figures are made of hornbeam, thanks to fabric substrates below glide across the board. Qualitatively made folding chess board, veneered in mahogany and sycamore. Inside the cell is to store chess pieces. 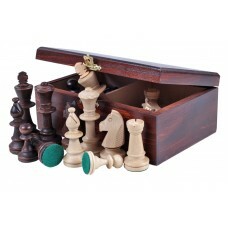 Board size: 54x54 cm,the chess board, that serves as a case for the pieces can be bent over. Figures: Wood, King height - 9.8 cm. Demonstrational checkers are made to order.